Great kids story, ghost dog story, friendship story. Super for kids reading books. birthday gifts, Easter gifts, anytime gifts. A ghost dog. A weird stranger. A hit and run. 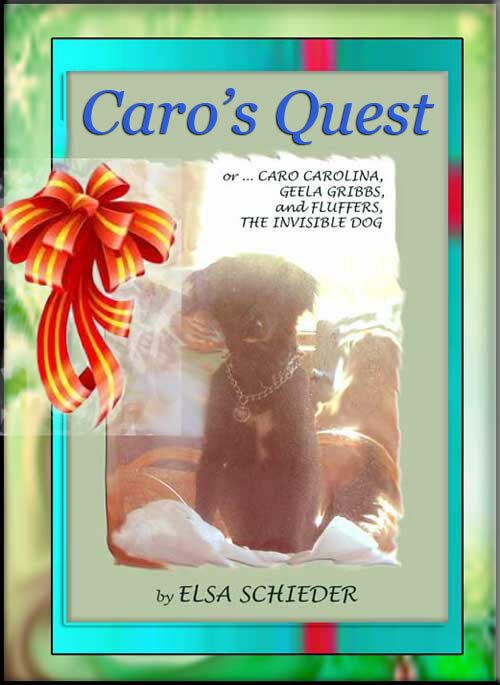 And Caro, 13, who wishes she had special powers. There's Caro Carolina, 13, who wishes she could do something special, be someone special - but has never had any special powers. 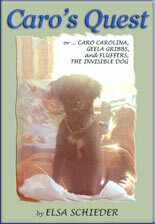 When weird Geela Gribbs comes to stay next door, Caro can't see her invisible dog. Is Geela totally weird? Or is just that Caro - as usual - has no magic abilities? Caro has so many questions. Like, what is real and what isn't? Are ghosts real? Even, is god real? Grownups have so many answers - all different. On top of everything, her two best friends have decided they're not talking to her. Then there's a hit and run. A classmate is left unconscious in the ditch. Even before that, something strange has happened. Fluffers has come to Caro in a dream. Was she just dreaming? Soon someone stop to talk with her - Doug, a classmate she's never noticed. He has seen the dog. for UPDATES on THE LAUNCH. Kids reading books love great kids stories. They travel into differently worlds. ghost dog story, friendship story. And then she snapped her fingers, looked downward, and said, "Come on, Fluffers." 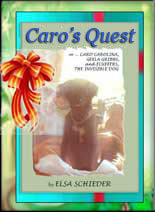 I love Caro's Quest so far - heck, I love your entire site. Not only does Caro's Quest have a beautiful narrative tempo, but also it could be an excellent didactical tool for teaching philosophical grounds to children and teens. There is also something engaging about reading / experiencing the life of a person who is 'different' in some way, somehow at an inner level, not outwardly different. How they 'make it work' for themselves is entertaining ... and at some level is validating to me as a reader. "She made it, so I can too" comes to mind.